mailed. Tie breaking refer to the B target first then the A target. BUG (BACK UP GUN) MATCH: $20 TO BE FIRED WITH REVOLVER OR SEMI-AUTO. EXCEED 3.5 INCHES IN LENGTH. FIREARM. HOLSTER MUST COVER THE TRIGGER. TWO MAGIZINES Minimum. FIRE WILL BE 5 RDS. WILL BE WEAK HAND. KNEELING USING THE BARACADE FOR CONCELMENT & SUPPORT. WILL BE WEAK HAND. STANDING USING THE BARACADE FOR CONCELMENT & SUPPORT. My 2015 ﻿​ 29th Annual Taylor Pistol Club Match Final Scores. Ruslan Dyatlov Crash course PPC. Here is the announcement you have been waiting for. The FOP 132 Annual Pistol Match (also known as the Gerald Carpenter Memorial Match) will be December 2, 3 & 4, 2016 at the Fenton Lakes Sportsman’s Club. We are hoping to have over 200 shooters this year! This will be the 40th year since Patrolman Carpenter was killed in the line of duty December 7, 1976! Now more than ever we in the police field are feeling the target on our backs just putting the uniform on. We have dedicated ourselves to not allowing this hero’s sacrifice fade away into obscurity. Please help us honor his memory by participating in this match that raises money to continue scholarships in his name! If anyone wants an ad in our Match Program you can contact me at this email address and I will get you the information. 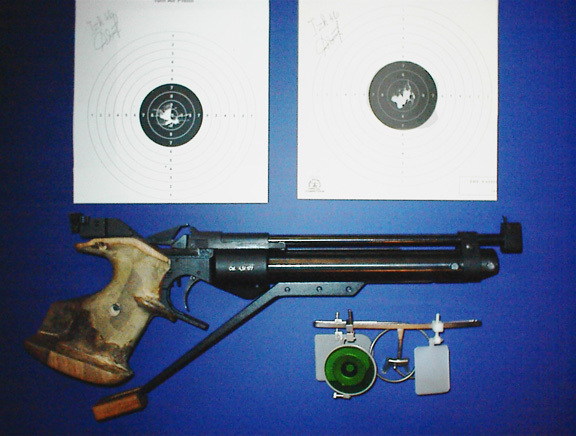 EQUIPMENT: NRA approved PPC Open Class Revolver/Pistol and other NRA approved accessories. Eye and hearing protection are MANDATORY and must be supplied by the competitor. Ammunition may be hand or factory loaded semi-wadcutter, wadcutter or service. NO MAGNUM AMMO. Ammunition shall be provided by the competitor. COURSE OF FIRE: NRA indoor P.P.C., 60 rounds, fired at 50’ on a B-27R target. Stage 1 will be 12 rounds in 20 seconds. Scoring will be on the Lewis system and will be done by the competitors. Challenges $1.00. NRA rules will be guidelines; Match Coordinator has the final say on all disputes, ties and decisions regarding the match! We will be having a 60 round SERVICE MATCH again this year. The course of fire will be the same as the PPC match but you must use a maximum 4” Revolver or maximum 5” Semi-Auto. This is a CASH match with 50% of the money being returned to the 3 place winners in 5 classes. DOOR PRIZES: Guns * Prizes * Guns * Prizes * Guns * Prizes * Guns * Prizes * Guns * Prizes * Guns * Prizes * You MUST be present for any door prizes. With the exception of the SUPER RAFFLE, you may only win ONE firearm. Door prizes and/or awards will start at approximately 6:00pm. SUPER RAFFLE: Tickets will be $10.00 each or 3 for $20. Colt Pre-Ban AR-15 5.56mm! Do not miss this party and PPC Match. 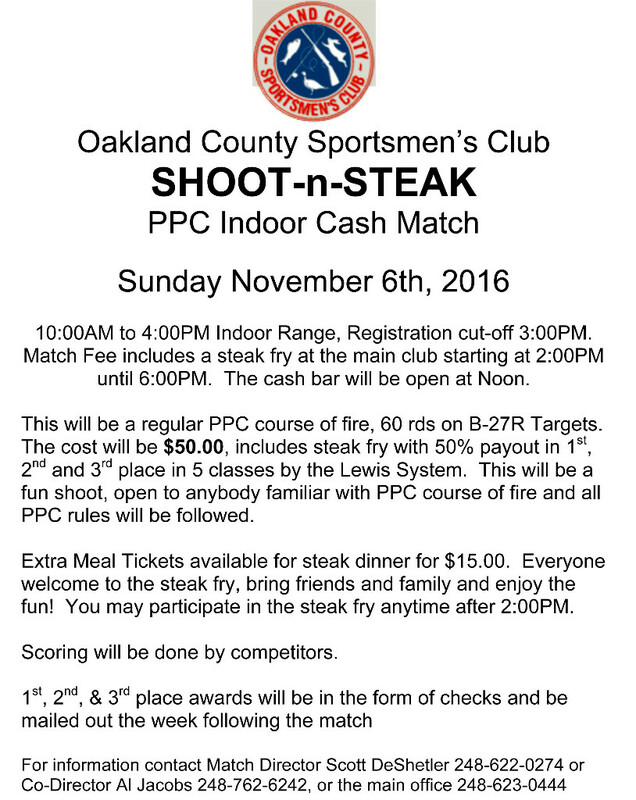 OCSC Shoot & Steak CASH Police Pistol Combat Match. MPCPA Annual State Indoor Championship. Ruslan Dyatlov :294+297=591 (33X) High Master. Today Alexandr scored his first air pistol match at Demmer Shooting Training Center (MSU). First Match and First Place. Good Job Alexandr! 2016 MPCPA Indoor State Championship Police Pistol Combat. 5 classes utilizing the Lewis System.